So I have a video for y'all today. Its my first video that I've made so please don't make fun haha:) I attended a class called the Ins and Outs of Youtube for Bloggers at the Build Your Blog Conference and I really thought it was such an amazing class! I learned a lot and it really gave me that push to start doing videos. I'm going to start doing videos once a week, and posting them on Tuesdays. Yes I know it's not Tuesday but I just wanted to start haha:) But from now on they will go live on Tuesdays! So please comment below and tell me what kind of videos y'all would like to see because I would love to know!! 10. Lip Balm: Using Coconut Oil as lip balm really locks in the moisture and really is a great balm. 9. Body Scrub: Mix Coconut Oil with brown sugar to use as a great scrub. 8. Make-up Remover: Use Coconut Oil with a cotton pad and it is a very gentle way to remove make-up. Just make sure to rinse it off after! 7. Shaving Cream: This is really good for people who have sensitive skin, especially when they shave. 6. Face Scrub: Mix Coconut Oil with baking soda. By doing this you have yourself a gentle face exfoliator. 5. Cuticle Oil: Use this on your cuticles if they have been looking dry lately. 4. Moisturizer: Mix Coconut Oil with Shea butter to get a great moisturizer. It will really help with areas like your elbows! 3. Eye Cream: Coconut Oil is actually a great way to hydrate the sensitive skin around our eyes. Not only will it leave it soft but it will help with wrinkles. 2. Frizz Fighter: Oil and water don't mix. So by adding some coconut oil before you head out the door you will have yourself a frizz fighter. Coconut Oil really helps with frizz! 1. Grow Your Hair: So this is my number one for a reason!! 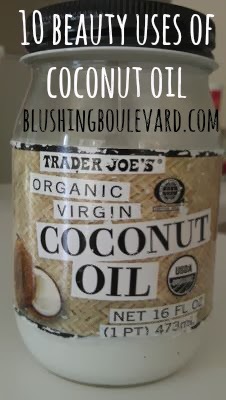 I love using coconut oil to help grow my hair out, and it really does work!!! Read this post HERE to see how to use it! I love using it on my skin and around my nails! It has so many great uses! I am going to have to use this for frizz! Thanks for sharing! !